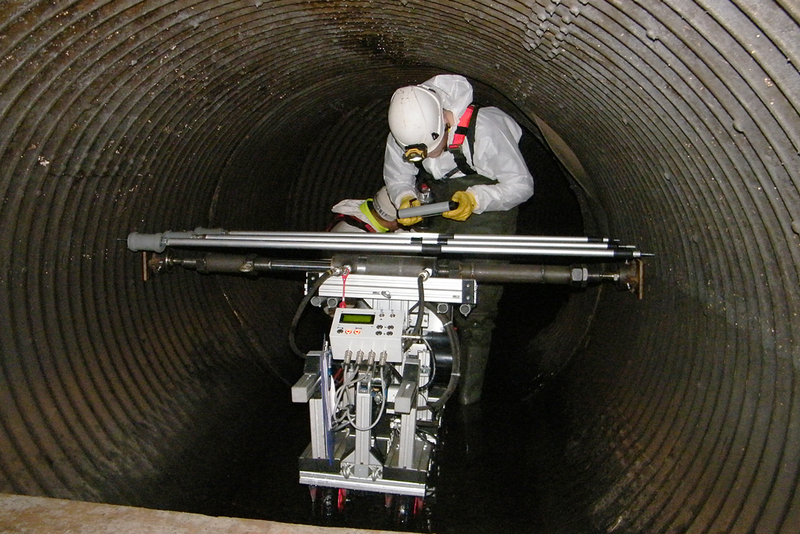 Non-destructive testing in sewers using the MAC system provides dependable data for structural assessment and, where necessary, selection of a rehabilitation method. There is a need for rehabilitation of large interceptor sewers for three reasons: hydraulic capacity, leak tightness and stability. 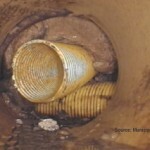 If the hydraulic performance of a sewer is not in order, it gets noticed. When groundwater ingresses, it gets seen. When wastewater egresses it can often be observed. But, failing stability of the fabric holds the threat of really serious problems. In the field of stability “safety” is the most important topic and there can be no compromises. When checking on stability, it is necessary to gather as much dependable data as possible. This requires assessing both the condition of the pipe itself and that of the surrounding soil system as accurately as possible and, if there is a need for action, taking well founded decisions on the solutions to be implemented. Dig it out or leave it in place? There is a method which is capable of accurately determining the condition of both the pipe and the embedment by non-destructive in-situ testing and subsequent calculations. This is the MAC (Mechanical Assessment of Conduits) system, which was first developed by Eau de Paris, the water authority for the French capital. 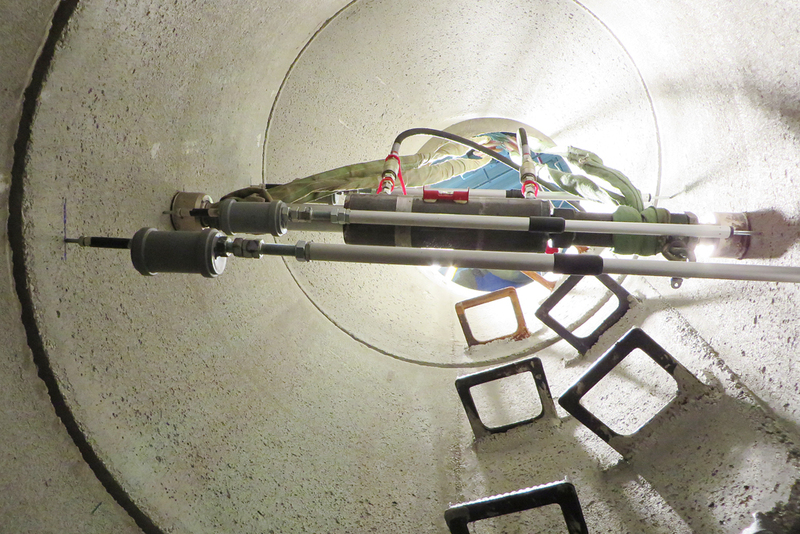 IKT ‑ Institute for Underground Infrastructure has modified this system for use in smaller diameters from DN 1000 upwards, and then further developed and partially automated the control and instrumentation technology used. “Our system enables system operators to implement sewer rehabilitation strategies that are rational both ecologically and economically”, asserts Dipl.-Ing. Martin Liebscher, project manager at IKT. 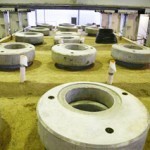 “This method provides benefits for the assessment of the stability of large-diameter sewers and for quality control inspection of completed rehabilitation work”. 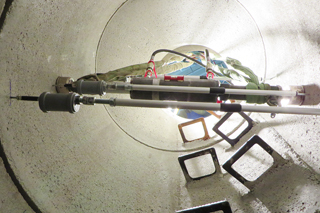 The MAC system allows you to examine stability beyond the pipe into the embedment and enables testing of the stability of concrete and masonry sewers with nominal diameters of between DN 1000 and DN 3000. 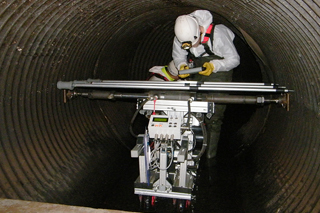 It makes it possible to determine whether a sewer length has any weaknesses and where they are located. Follow-up analysis can identify the nature of such weak points – is the pipe wall too thin, or is the embedment no longer in good order? … comprehensive information on the pipe/soil system. 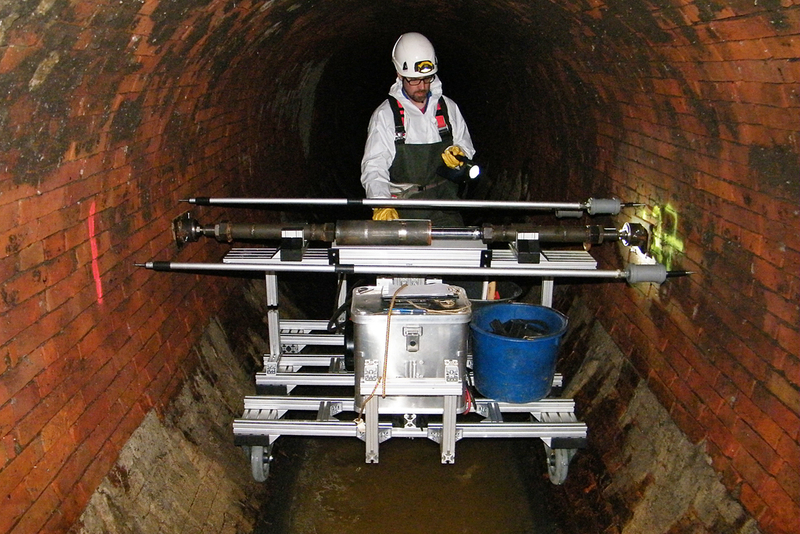 … indications of where more detailed investigations into the quality and geometry of the sewer are needed. 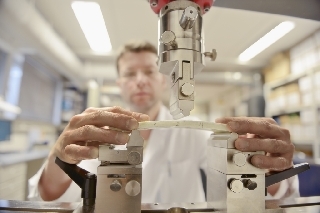 … together with the results of FE calculations and drill cores, the basis for structural analyses. … systematic application of rehabilitation procedures around the respective weak point. … extremely dependable assessments of stability. … for quality assurance of completed rehabilitation projects. … for periodic inspection of critical zones based on structural analysis criteria. 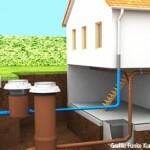 … for inspection of correct installation and embedment of new sewer construction projects. The MAC system exerts a controlled force on the pipe wall in the sewer using a hydraulic press to generate a minimal ovalisation of the sewer cross-section. The deformation allowed and the force applied are kept sufficiently small, by a precalculation, to prevent any damage to the sewer structure. The tiny, localised deformations to the pipe wall that result are measured using position sensors and are entered into a computer simulation. 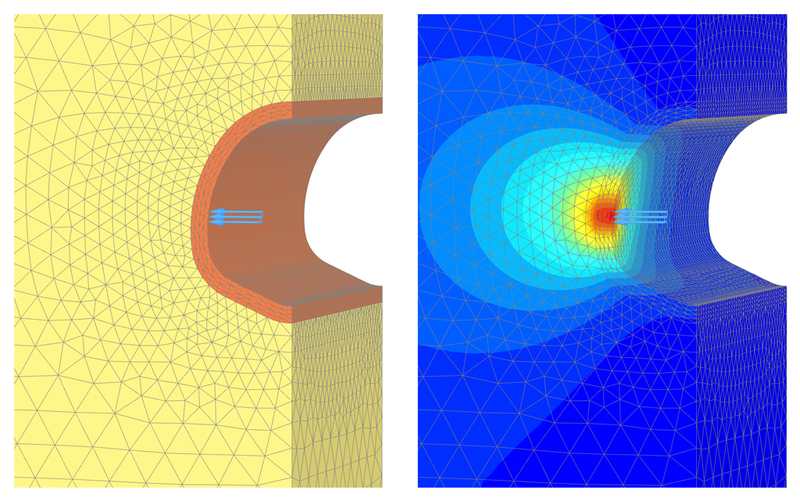 A three-dimensional Finite Element (FE) model of the sewer, complete with the corresponding test data, is generated and the condition of the pipe and the bed is determined at each inspection point using sophisticated variation of parameters. 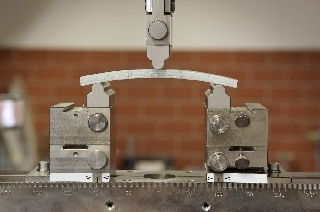 The results provide reliable input data for structural analysis and for indicating effective rehabilitation procedures. The procedure for assessing the performance of rehabilitation using the MAC system is, from initial determination of condition to long-term quality checking. 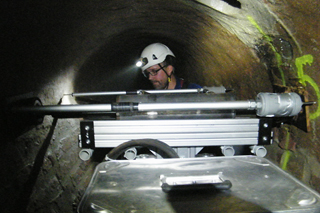 The MAC system operators first obtain an initial impression of how to conduct the inspection by entering the sewer. Parameters relevant for the MAC inspection are recorded (e.g. changes in cross-section width and height, connections, inflows and reinforcing components). A measurement matrix and the location of measuring points for the MAC inspection are determined, and the MAC inspection is then performed. The MAC unit can be easily disassembled into modules, so it can be lowered into the sewer via a standard manhole shaft. The system is then reassembled in the sewer ready for use. 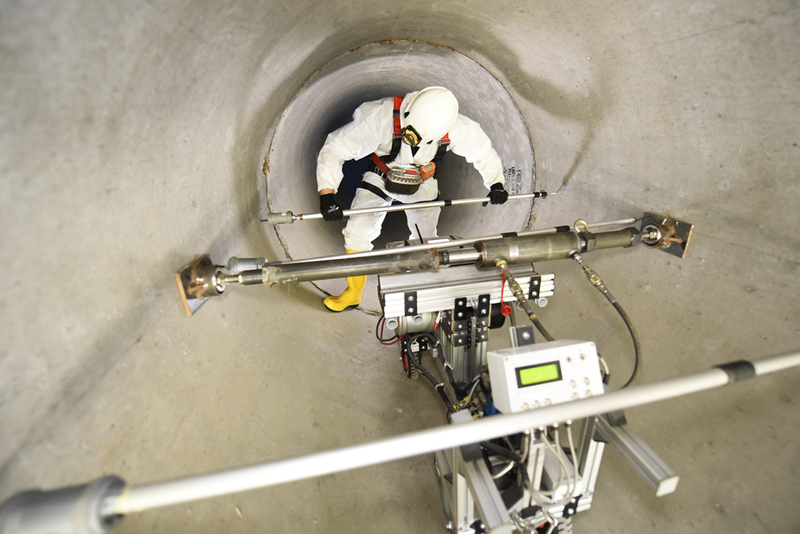 During the testing, a high-pressure cylinder is used to apply sufficient force to the walls, at specified intervals along the length, to move them under control a few tenths of a millimetre apart without causing damage to the sewer. Fine sensors measure the resulting deformation in the vicinity of the hydraulic ram and at distances of around one metre ahead and behind it. This very slight deformation is sufficient to permit derivation of the condition of the pipe and of the soil, on the basis of the deformation pattern and the force exerted. An initial control calculation is performed on a computer, prior to the measurements being taken, to determine the expectation range in which the measured data should lie. Deviations are then immediately apparent. In case of doubt, a second measurement can then be made at the relevant points. Where deviations are then confirmed, those points in the sewer can be further investigated (e.g. by the taking of drilling cores or undertaking an exploratory drilling operation). Following the survey with the MAC unit the overall stiffness of the pipe-embedment system at the points of measurement is determined. The measured data can then be used for classification of the entire sewer length into zones of identical pipe/soil stiffness. Potential weak points can then be directly located and the locations that require more detailed investigation can be systematically specified. The in-situ measurements provide the general reaction of the pipe/soil system to the pressure applied by the MAC unit. These figures are purely mathematical variables and are dependent on the test apparatus and the sewer structure. Further analysis is necessary to derive data which can be entered into a structural analysis, which is undertaken by simulation of the entire pipe/soil system the form of a three-dimensional FE model. To do this calculation the geometry of the sewer (its shape and its wall thickness) must be known (e.g. from sectional drawings and construction documentation). 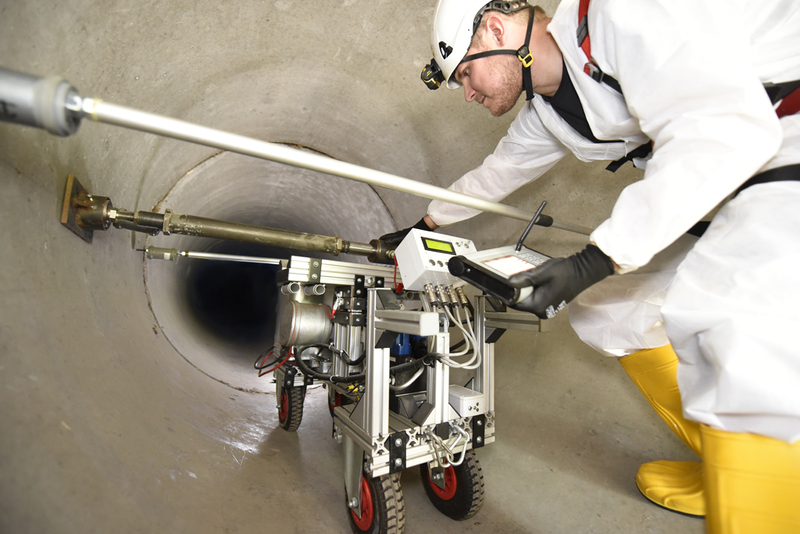 These measurements and calculations, provide detailed results and open up previously undreamed of possibilities for sewer assessment. “We can use the supporting FE computations to determine, for example, whether a pipe is cracked longitudinally or transversely, and we can also differentiate between Old Pipe Condition I and II”, states Dr.-Ing. Mark Klameth, expert in FE calculations at IKT. “This is important in deciding on the rehabilitation method. Or we will find, on the basis of the specific deformation pattern, a weakness in the embedment. The MAC procedure can also be used to check the condition of a length of sewer at regular intervals, to permit periodic inspections“. The MAC inspections and FE calculations make up an overall package. The measured data from the test and the moduli of elasticity calculated from the FE analysis permit statements to be made concerning the uniformity of the pipe/soil system across the entire length of sewer examined. The calculated moduli of elasticity are reliable input data for calculation of a pipe structural analysis. A structural analysis in accordance with DWA-A 127 or DWA-A 143-2 can be performed where detailed planning documentation is available and/or where wall thicknesses and strengths have been determined on the basis of drilling cores. Where a need for action is apparent, the large amount of data obtained provides a reliable basis for stipulating rehabilitation targets. The results of the MAC inspection and of the FE calculations can then be used for specifying these targets. For this purpose, the sewer can be subdivided into different rehabilitation zones according to criteria such as: water tightness, improving hydraulics and the retention and/or improvement of the existing system fabric. In improving the system fabric, rehabilitation work may be systematically focused around particular weak points (e.g. using shotcrete linings or renewal of brickwork pointing for structural rehabilitation of the pipe; or grout injections for improvement of the embedment). Later in a rehabilitation project, the MAC system can be used again for quality assurance assessment of the completed rehabilitation work, or for the periodic re-inspection of critical zones for structural analysis. Direct before/after comparisons and also trends against time can be measured and recorded using the MAC system. Consequently, the immediate and long-term effects of rehabilitation provisions can be directly determined. This procedure can also be used for checking correct installation and embedment for new sewer construction projects. In this case the planned boundary conditions are known and so “target values” can be specified for subsequent in-service inspection. The use of the MAC system for quality assurance of new pipes could result in considerable savings for inspection of large-diameter pipes. Just as the MAC system works for inspecting old or new pipes, it can also be used whether they are installed horizontally or vertically. 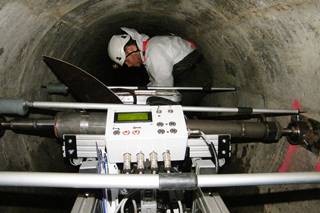 Consequently, manhole stability can also be inspected using the MAC system. This application has been refined by testing stability as part of IKT “manhole-shaft coating” product testing. During these, manhole shafts were inspected using the MAC system in new condition, in cracked and unrepaired states, and then following rehabilitation using various methods. The advantages of the MAC system become particularly apparent when compared to the traditional procedure. 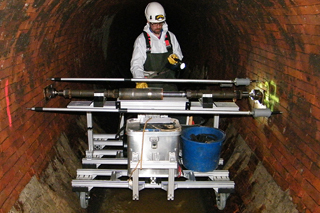 Up to the present time, the assessment of the stability of large-diameter sewers has generally been labour and cost intensive, involving low potential for success and high risks of failure. The results of condition assessment are of great importance for subsequent selection of the rehabilitation method. The optical or visual inspection that is usually practised supplies inadequate information on the condition of a sewer, since only the immediate interior surface of the sewer can be assessed in this way. Faults located behind a “normal” looking surface remain concealed. The MAC system, on the other hand, makes it possible to “look” deeper into the pipe wall and beyond into the embedment, making it possible to detect more than simply weaknesses that are apparent on the surface. Assessment of the zones behind or in the sewer wall, of the soil located above them, and of any overlying roadway structure, is necessary for appraising stability. Therefore, as part of the investigation, drill cores are usually taken at points where problems are apparent, or on a random basis. In particular, wall thicknesses and material strengths can be determined by random sampling. 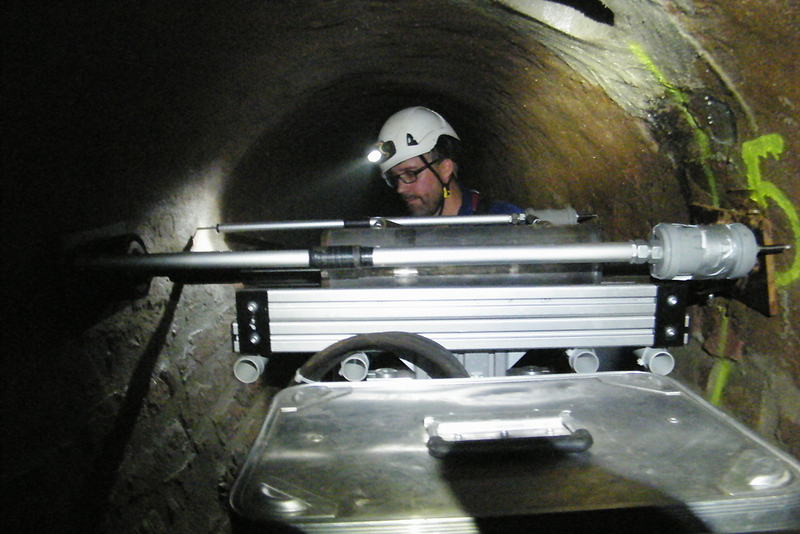 Using the MAC system, measurements are made along the length of the sewer at defined intervals (generally every five to ten metres). Drill cores can then be taken extremely systematically if weak points are revealed. And, if no indications of weakness are found, there is a significantly greater probability that there really is no problem, thus potentially saving unnecessary expenditure on rehabilitation costs. Classically, exploration of the surrounding soil has generally been conducted by means of boreholes drilled from the surface. However, this method is used only very sporadically, since such holes are both expensive and require a cross-section free of other utilities’ pipes and conduits. The MAC system makes it possible to make statements concerning the condition of the embedment of the sewer along the length of the sewer. Where measured data indicates inadequate embedment (e.g. as a result of scouring), the areas affected can then be systematically examined in greater detail. The classical procedure for assessing sewer stability can result in significant misinterpretations concerning structural condition and the need for rehabilitation. It only allows reliable assessment of stability and well-founded selection of the best rehabilitation method to a limited extent. 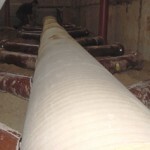 In addition, the classical procedure does not afford the option of re-inspection of the repaired pipe/soil system. 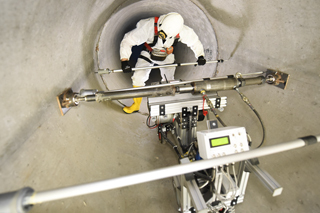 The MAC system provides broader data for the selection of rehabilitation methods and a basis for the sewer system operator to make well-informed decisions. The MAC system also permits direct before/after comparison following the completion of a rehabilitation project. Comparative assessment of the measured data before and after the rehabilitation work provides certainty as to whether the provisions implemented have been effective or not. The costs of using the MAC system and the subsequent calculations applying the Finite Element Method are below the annual replacement value costs for large-diameter sewers. Estimated annual replacement costs are 30 euros per metre, assuming construction costs of around 1500 euros per metre and a fifty-year depreciation period. 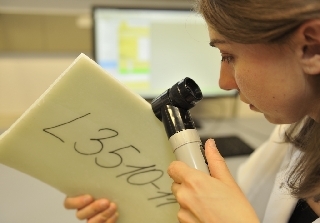 A MAC inspection costs around 18 to 25 euros per metre, which includes: delivery using the MAC deployment vehicle; assembly and disassembly of the system; performance of the inspection; and the costs of the FE calculations. These costs do not include: traffic control provisions, ensuring non-hazardous access to the sewer (cleaning, cordoning off, ventilation, etc. ); and, any core drillings. 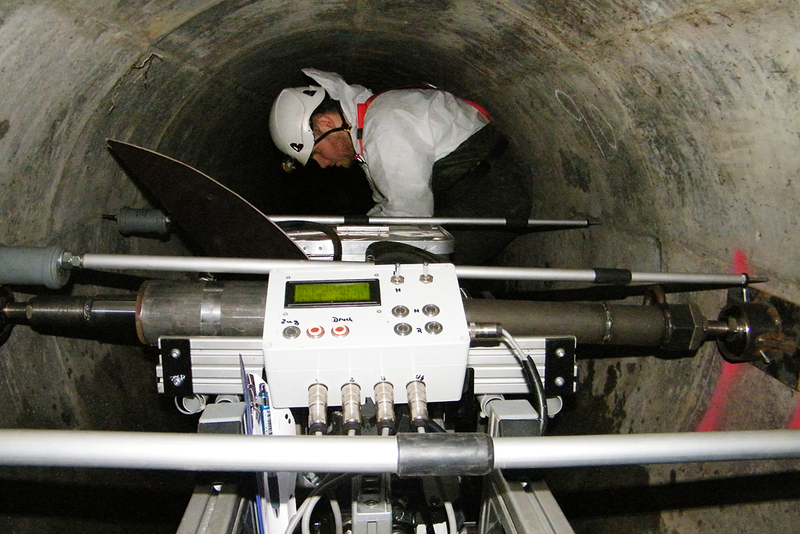 The actual costs per metre of sewer of using the MAC system are dependent on the number of measurements to be performed (e.g. at 5m or 10m intervals) and on other conditions, such as accessibility and time of day when testing can be performed. Daily rates of inspection, under optimum conditions, are around 200 to 300 metres, assuming a measuring interval of 10 metres. This rate can be increased during multi-day deployments if the MAC unit can be left in the sewer overnight, so eliminating setting-up time. IKT has already used its MAC system in a number of large and medium-sized German cities, such as Hamburg, Düsseldorf, Schwerte and Worms. 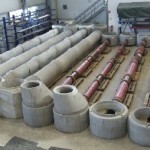 For Wessex Water, a water and wastewater network operator in South West England, the MAC system was shipped over to investigate pipe and the soil stability of sewers in Bournemouth, on the Channel coast, and in Weston-super-Mare, near Bristol. The network operators in these cities now know the condition of their large-diameter sewers and their rehabilitation options.